Rigol DSA800 Spectrum Analyzers ! !Special Offers!! 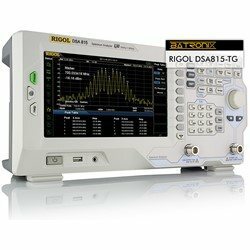 The Rigol DSA800 series are compact and light weight Spectrum Analyzers with premium performance for portable applications. The use of digital IF (intermediate frequency) technology guarantees reliability and performance to meet the most demanding RF applications. 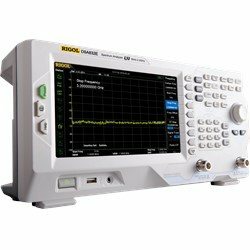 Rigol's new DSA800 series spectrum analyzers redefine the product category by setting new standards for performance and price. The DSA800 family features a unique widescreen display, compact design and easy-to-use interface and operations, making it ideal for benchtop or field apps in RF and wireless testing and production. The new spectrum analyzer offers the ability to measure smaller signals using our digital IF filter, which allows for smaller bandwidth settings and reduces displayed noise levels. The DSA8000 have RBW settable down to 10 Hz and a DANL (displayed average noise level) down to -161 dBm (typical). Rigol offers great options including an EMI filter and quasi-peak detector kit, and tracking generator for all of these models. 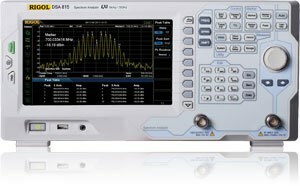 Whether your application is radio verification at 455 MHz or monitoring the 3rd harmonic of 2.4 GHz signals find the right spectrum analyzer in the updated DSA800 family. High quality spectrum analyzer from 9 kHz to 1.5 GHz. Power cord and quick guide. High quality spectrum analyzer from 9 kHz to 1.5 GHz with Tracking Generator. High quality spectrum analyzer from 9 kHz to 3.2 GHz. High quality spectrum analyzer from 9 kHz to 7.5 GHz. High quality spectrum analyzer from 9 kHz to 7.5 GHz with Tracking Generator.